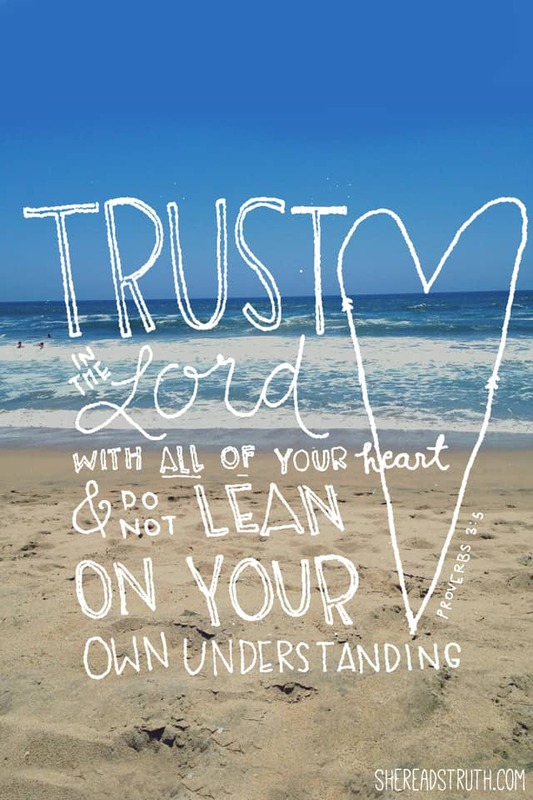 If you are stopping by from The Mom Creative, welcome & thanks for clicking over! If you are not, you might want to click over there when you’re done here for some more great Project Life inspiration! Can you believe March is almost over? Especially so since we never really had a winter here. We went from fall to a pseudo-spring-winter-type season and then spring/summer has begun. Crazy. Of course, the kids and I can’t wait for school to be out and we’re looking forward to spring break next week – no early mornings and a much easier schedule. I’ll still be working, but I’m sure we’ll fit some fun adventures in during the week. Here are my pages for the past week. Somewhat simple, but I like them. 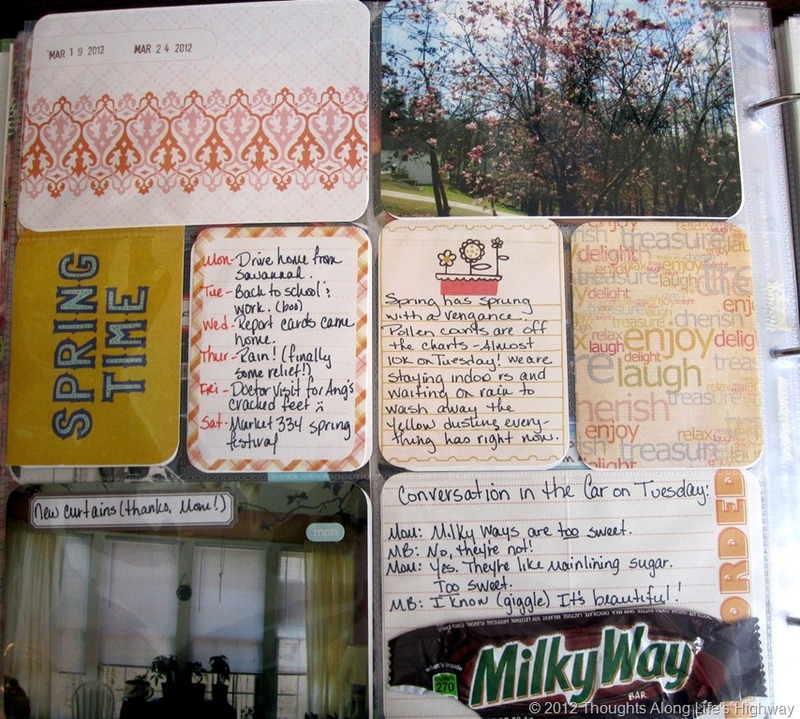 I stuck with a color scheme of peaches, light blue, and pinks… in keeping with my Project Life journal cards I had chosen. It was fun to find other things to add to the mix that complemented those colors. LOVE using my chats and capturing the little things – also loving this picture of Big Girl and Superman from Saturday. Like I said; sweet and simple this week. But I like it. Love your pages. 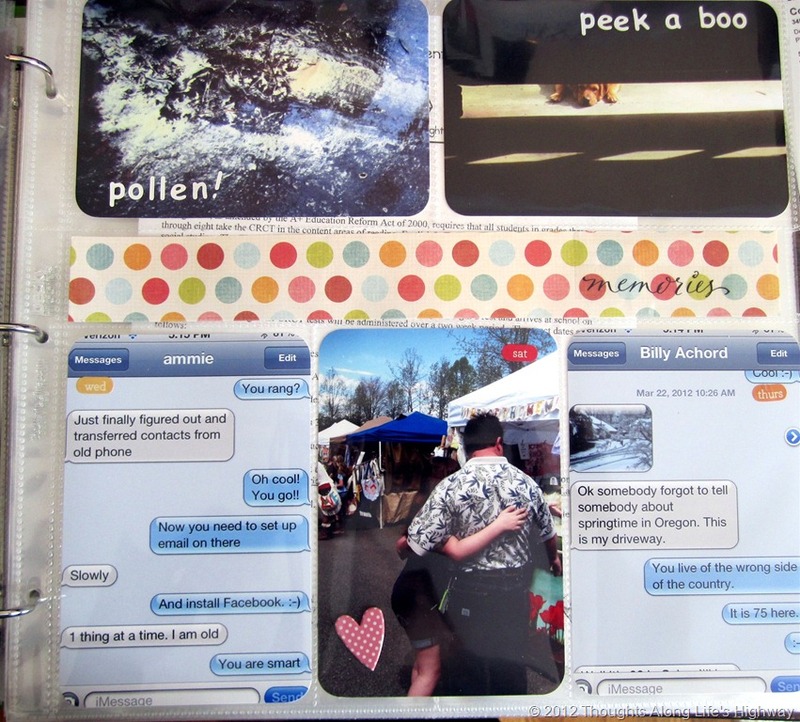 The piece of patterned paper looks great and I like the way your have used the phone messages. Great week. Thanks for sharing. great texting boxes added! yay. and i love your handwriting! Love the texting boxes! Too clever! Sweet and simple absolutely works! 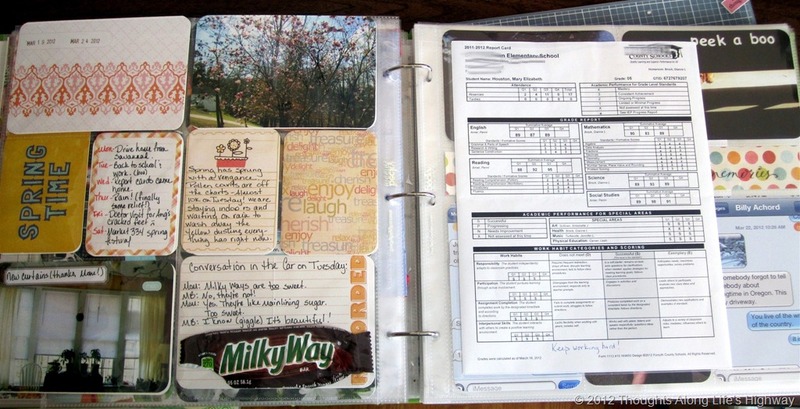 Your pages are great – and I love the way you included the Milky Way wrapper. And thanks for stopping by and commenting on my blog! Looks great! 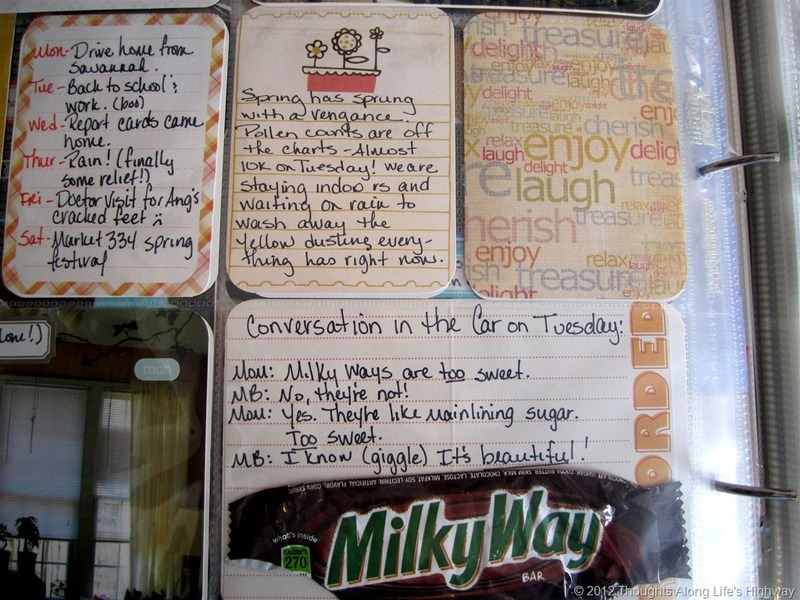 Love the conversation about the Milky Way & how you added the wrapper. love it. especially love the milky way conversation and the texts!!! Thanks! I love capturing those “in the moment” things – things that you wouldn’t remember if you weren’t doing this week-by-week but that mean so much later when you look back. Your pages look nice. I like that color scheme. 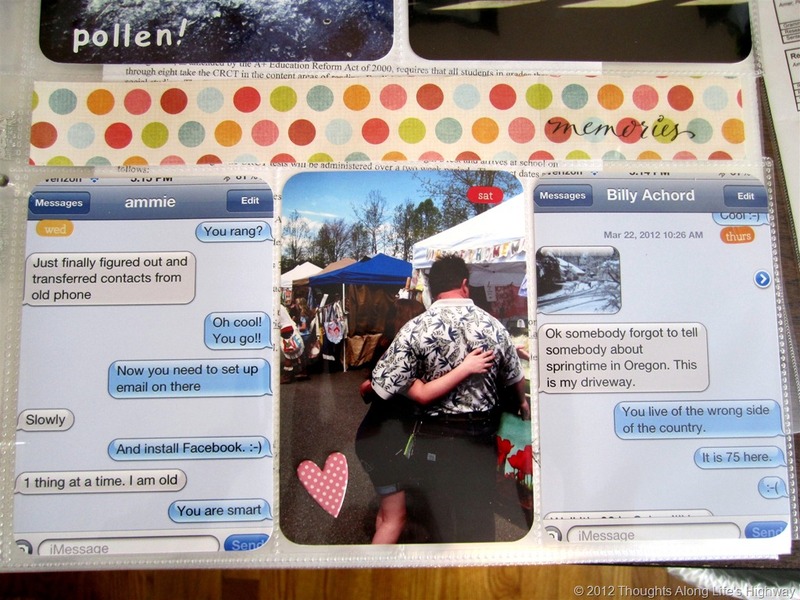 Cool MilkyWay add in ;0) but that pollen picture makes me want to sneeze–yuck! The pollen has been terrible this year! Love your pages–such nice clean lines. One of my favorite things, too, is taking pictures of texts, the weather, you name it with my iphone! 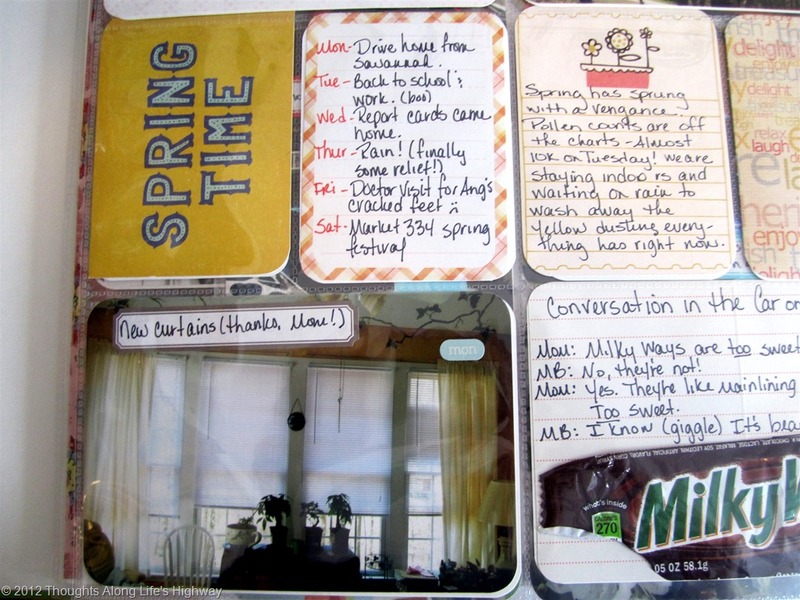 Love the captured conversation about the candy bar. Love the conversation about the candy bar!